Articulate is a software company that has developed software packages for creating online, interactive, e-learning course presentations. 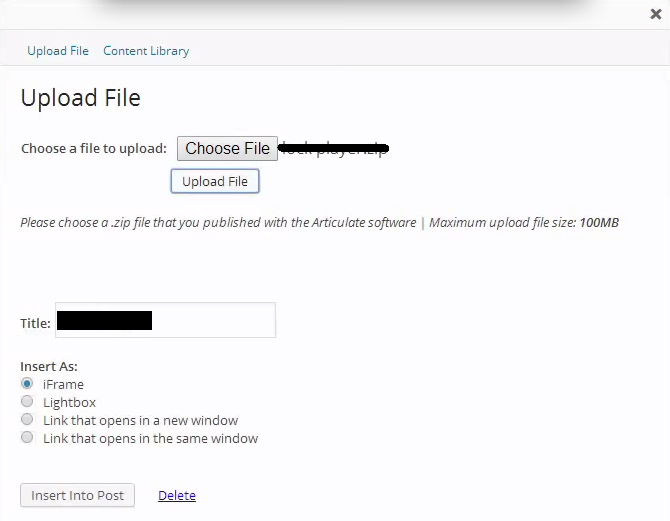 There is a plugin for WordPress called “Insert or Embed Articulate Content into WordPress” created by elearningfreak that allows content editors to easily upload and embed Articulate content into their WordPress posts. One of our hosted website customers had installed the plugin in their WordPress site. The plugin installed without issue, and they are able to see the button for uploading the content. This screen just remains indefinitely, and the progress bar continues from left to right until we eventually exit. The file we were initially working with was small, (transfer time of less than 2 seconds using FTP) so it was unlikely that changing our maximum file size or execution time would resolve the issue. We tried anyway, but this made no difference. Next, we decided to contact our good friends at Munter Westermann Arts and Media. As web design and development experts, I thought they may have seen this behavior, or something similar, before. They came back with 2 interesting items: a workaround, and a possible solution. As of the writing of this article, this exact question is posted here without an answer. So of course this points to a host issue – and we are the hosting company. We enabled the “Zip” functions and built the new PHP profile. As soon as this finished, logged back into our customer site and tested the “Insert or Embed Articulate Content into WordPress” plugin again, and it completed without issue. If you are experiencing an issue with your Articulate archive uploading through this plugin, and the recommended php.ini file changes haven’t helped, reconfigure, or ask your hosting provider to ensure that the “Zip” functions are enabled/installed for your site. Good luck, I hope this is helpful. Hello. My name is Brian and I’m the author of this plugin. Thanks to articles like this, we were able to find and fix the issue that the plugin was experiencing. This particular issue is addressed in version 4.1.7. Thank you for checking in and posting this update. Much appreciated, and great to see there is a fix!